The following is from the manuscript of the autobiography I have been working on for quite a few years. Today it is fascinating to review the past, such as my spending Gem 1928 Peace dollars because I had too many of them. Now they are worth over $3,000 each! 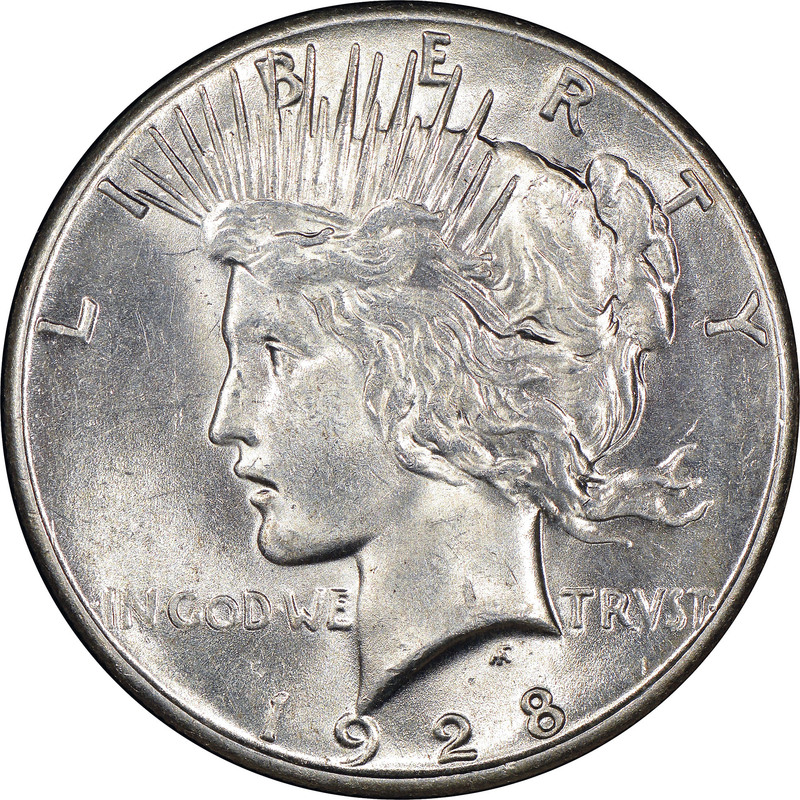 1921 Peace dollar. Hover to zoom. In 1952, when I started in numismatics, there was not much interest in Peace-type silver dollars among any of my acquaintances. According to the Guide Book, a complete set in Uncirculated grade, 24 varieties from 1921 to 1935, could be purchased for less than $100. As my horizon expanded and began attending coin club meetings and conventions, there was still little enthusiasm. Edmund Karmilowicz had a complete set of Peace dollars, all sparkling bright, but I know of no others in the Wyoming Valley. 1903-O Morgan silver dollar, graded MS-67+. Morgan dollars were not popular either, and at the Wilkes-Barre Coin Club, they were rarely brought by anyone for sale or trade. By 1955 the situation changed, and I kept selected pieces in my inventory, typically for sale to mail order customers, not to local enthusiasts. The rarity of rarities in the series was the 1903-O. I had never even seen an Uncirculated example, let alone owned one. Even worn specimens were elusive, but a Mint State piece was virtually unheard of. By that time I had digested the contents, or at least skimmed, most auction catalogs dating back to the early 1900s and some earlier ones as well. The 1941 Dunham Collection auction by B. Max Mehl showcased an Uncirculated 1903-O as a rarity. Alerted, I kept my eye out for one. At the time, silver dollars were available in endless numbers from banks in the Wyoming Valley, although in the East silver dollars were not used in everyday commerce. My local source, the Forty Fort State Bank, did not have many dollars, however, and once I had searched through them there was not the possibility that they would be getting any more until these had been paid out. A few miles away was the Kingston National Bank. I took $1,000, representing a good deal of my capital as a beginning coin dealer, and went to that bank, and began looking through bags of dollars. At the time, most bags were mixtures of worn Morgan and Peace dollars. The most common of all issues was the 1921 Morgan, which was usually seen in grades from Extremely Fine to what we would call MS-60 today. 1922, 1923, and 1924 Peace dollars were also in abundance, so much so, that the 1921 Morgan dollar and these three dates of Peace dollars probably accounted for 25% or more of a typical bag. Philadelphia Mint coins of earlier dates also abounded, with the Morgan dollars from 1878 through about 1891 being very common in grades such as VF, EF, and AU. Scruffy-looking Uncirculated coins were also found, but it was apparent that most of these had been mixed in with worn coins and had been stored with them for a long time; they were not from fresh bags recently mixed in. Nearly all of the coins in such a bag had a uniform color: Dull brownish gray, “vault grime,” so to speak. This could be removed with ammonia or with the careful application of acetone (inflammable and not to be breathed). Uncirculated Peace dollars were common. Virtually all were all of Philadelphia Mint issues and included quantities of 1922, 1923, 1924, 1925 (these came out in a hoard release around this time), 1934, and 1935. I liked 1921 Peace dollars, and remember well that most found in Treasury bags were EF to AU, often with very deep gray, almost black, toning, for some reason the only date with this characteristic. Some had a rather ugly deep gray-golden color. Uncirculated coins, when they showed up, were apt to be barely so. I never saw a bright gem-quality 1921 Peace dollar in my sorting. 1928 Peace dollar. 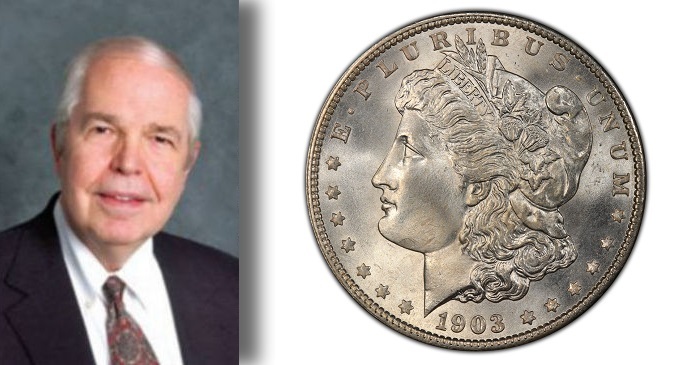 Photo credit: Numismatic Guaranty Corporation. At first, I saved 1928 Peace dollars, for they have a low mintage figure, and there used to be a notation in the Handbook of U.S. Coins to the effect that 1928 dollars were made only for cornerstone purposes and never otherwise distributed. The typical 1928 would be in Uncirculated grade, with a beveled rim (characteristic of the issue), and would be mostly brilliant. 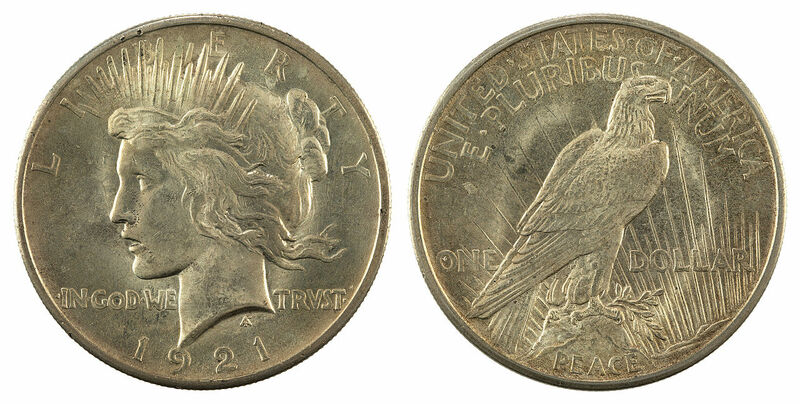 Because of the beveled edge, these could be recognized without seeing the date—such as by the reverse or by the obverse if the date was covered by another coin. All were nice-looking coins of high quality with very few bagmarks, what would be called MS-64 to 66 today. Although they had a market value of, say, $5 to $7, customers for them were scarce among my mail clients, and no one at the Wilkes-Barre Coin Club was interested. Soon I had nearly 100, but I cashed in all but a handful, so as to put my capital to better use. Although I had no way of knowing, perhaps while 1928 Peace dollars were common for me, it could have been the case that elsewhere they were few and far between. I also kept a weather eye out for 1934-S Peace dollars. These showed up with frequency, but among the bags I sorted, the 1934-S coins were all worn, some of them down to the VF level. In 1955 I often wondered how a coin minted just 20 years earlier could have become so worn. Presumably, they were used intensively in the West. Uncirculated Peace dollars of other dates were usually bright, indicating that they had been mixed into bags relatively recently (or else they would have acquired the usual vault grime). Sometimes they would have nasty, little white “water spots” on them that I could not remove, even by carefully dipping them. Other Peace dollars had a rusty yellow-orange tint, probably from being stored in damp bags or damp vaults. However, most were sparkling and bright. I recall that Philadelphia Mint 1934 and 1935 Peace dollars were very plentiful, usually very bright, and with minimum bagmarks—coins that would be called MS-64 or MS-65 today. 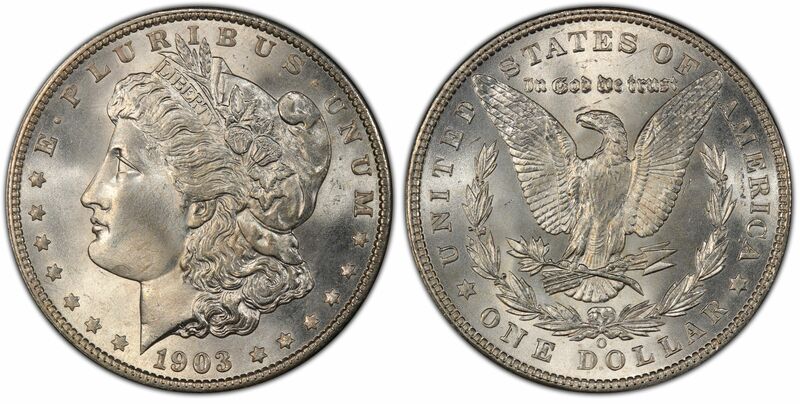 Most Morgan dollars were in worn grades, except for 1886, 1887, and the pesky 1921—the last being very common and with absolutely no premium value. In fact, there would have been no significant premium for a bag full of Uncirculated dollars of any of the dates I encountered, if I had found such a quantity. 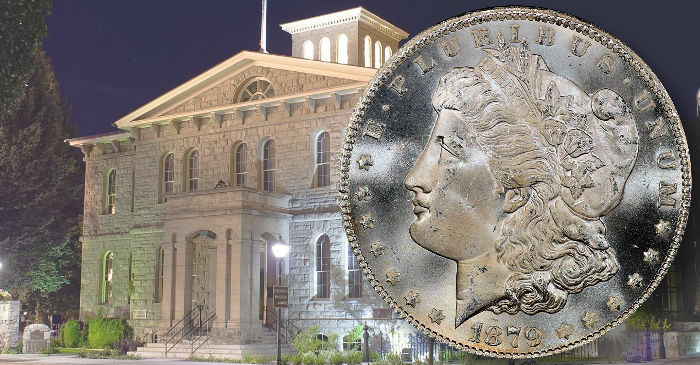 The Carson City Mint. Background photo by Schrantz. Carson City coins were very scarce in bags I looked through, and it was only occasionally that I found them. I eventually found all of the Carson City dates, but the typical grade was apt to be VF or EF. Some were worn down to the VG to Fine level. Obviously, at one time such coins saw hard and long use in circulation, again undoubtedly in the American West. I don’t recall ever finding a Carson City dollar with even a small amount of mint luster. New Orleans coins were next on the list of desirability, with the 1903-O being especially nice to find. In the course of looking through many thousands of worn coins, I picked out a few 1903-O dollars in lower grades. Worn San Francisco coins were very common, and over a period of time, I found quite a few 1892-S (which was not considered to be scarce in worn condition) but, as far as I remember, none of the 1893-S. Most such San Francisco coins were in grades such as VF and EF, although there were AU specimens in quantity. I never found an 1895 Philadelphia Mint coin in a bank bag, nor did I ever see a Liberty Seated dollar. 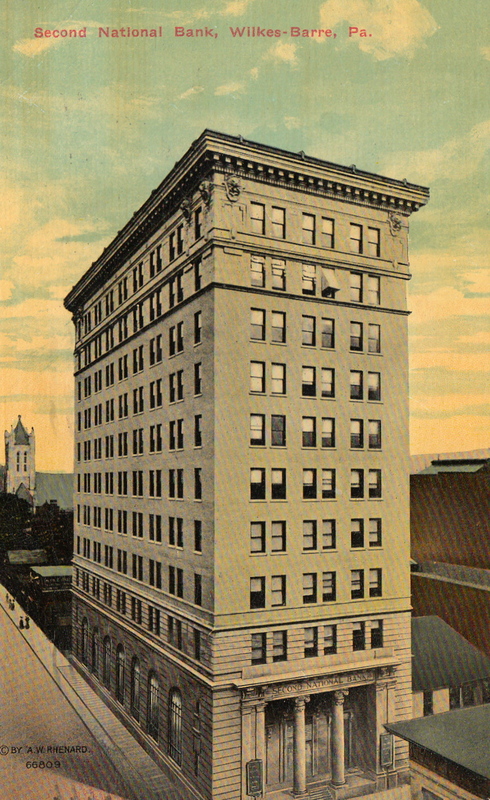 The Second National Bank of Wilkes-Barre, Pennsylvania. The Second National Bank and Miners National Bank, both of Wilkes-Barre, were also very helpful. The Second National Bank had a teller who was a coin collector, and when he thought he had something I might like, he would give me a call. I visited there often as I kept my inventory in a safe deposit box there, and my dad’s engineering office was upstairs on the second floor. In October 1955 the Second National got a bag of Mint-fresh 1903 Morgans, a scarce date, and sold them to me for face value. I had a field day selling them for $7.50 each. I also bought quantities of newly-minted 1955 Franklin halves which commanded a premium at the time. By 1956 the market for silver dollars perked up dramatically, and I had many calls for them. Around this time, or in 1957, Abe Kosoff had a client who wanted 15 bags of Uncirculated Morgan dollars. Abe’s client, who lived in California, had all of the San Francisco Mint bags he wanted, and now he desired some Philadelphia coins. He sent me a check for $16,500, representing my profit of $1,500 over face value. I went to the Miners National Bank and asked them to order from the Federal Reserve a group of 15 sealed bags of as many different Philadelphia Mint dates as possible. There was no problem in placing such a specific order, for a few days later the bags arrived. While there were not 15 different dates, still there was a nice assortment. On my own, I did not want bags of Uncirculated Philadelphia Mint dollars, most of which were dated in the 1880s, because there simply was no market for them. If anyone had wanted to buy 100,000 Uncirculated Morgan dollars, or a million of them, for face value, there would have been no problem. From time to time Abe would order additional dollars—always an easy way for me to make money without much effort. Abe was a fine dealer friend. By that time he had been one of my main suppliers of patterns and other coins. Always nice to read Bowers’ writing. I’m looking forward to the autobiography. I wish the Mint still minted and released silver coinage, in any percentage. I’d imagine this would create a larger group of new collectors every year. Also, I’ve always thought that the Mint should regularly release low mintage varieties, errors, and pieces (e.g., Britain’s recent limited release of its ten pence alphabet coins). Perhaps the Mint doesn’t want hoarding of coins, reminiscent of the unfounded fear of collectors hoarding coins in the mid-60s. Not sure. Thanks. The mint should make a certain amount of Peace dollars every year – that would create a lot of joy in the coin collecting world for sure. I enjoy reading stories of yesteryear and how the old time coins circulated and even rare pieces could be found. I wonder if businesses would give out the cartwheels as change or was it the case in the west that you were paid by your employer in cash which included the dollars. Since the coins were worn, it had to have been some way they circulated. I wish I could go back to that simpler time…. I too am looking forward to Mr. Bowers Bio. Im relatively new 3-4 yrs.collecting and am still trying to figure which variety is most sought after now for investment and to hand downto my children. I try to spend 3-7 hundred monthly and wish to build a worthy collection. Anyone have any notable suggestions? Good post. I wikll be facing some of these issues as well..
Gee I wish I had the capital to buy 100,000 peace dollars. I love them things. Morgan’s too. Hmm.. suggestions for someone who is new the the hobby / activity. Well, I’d have to begin with first & foremost, enjoy the activity – much of the pleasure in collecting is the pursuit, finding something you’ve been after for a long time and speaking of finding something, put together a “want list” so you can stay focused. Second, decide what kind of collection you’re building, investment, enjoyment, theme, bullion-related, silver crowns, early American gold pieces, specific era etc… any or all of the above but try not to “go in every direction” if you’re putting together a collection as a serious investment because ultimately, you will need to know everything about each coin as though it was your stock portfolio – because essentially it IS your investment. Remember, you don’t have to spend something every month, it might result in your amassing a collection of coins of minimal value with little scope for real long-term investment, some coins just “stay the way they are” in terms of price because they were of limited potential in the first place. If you are looking to pass on something to the next generation, look for quality and that means the best grade possible – and this is what I meant in my paragraph above. It might be worthwhile to spend good money on one piece than a few dollars on many pieces – quality vs. quantity. On the other hand – even I can get alot of excitement from rummaging in a coin shop’s junk box but that for me that’s purely to piece together sets and to find something that eluded me when I was a younger collector. I hope some of these suggestions are helpful, and I hope collecting gives you years of pleasure – some valuable finds go a long way in terms of encouragement. Keep us updated with interesting finds.